My curiosity is greater than my research skill, I have been rummaging around in cyberspace and at some of our local institutions. I stumbled on this website looking for islands in the river. I love the architecture and accessibility of this whole site. The past and present section is really, really cool. It has some typos and at least one factual error, but I like the structure. There is also a current project with student researchers working on a walking tour about the geology of the Falls that Kent and I chatted about. I attended Karen Cooper’s presentation about Minnehaha Falls which focused on the same image of the falls over time. Now that I have seen many images of Spirit Island, it does become an interesting focus to view the changes around it at the Falls. Literally the eye of the storm. Karen also brought her stereoscope and some cards. I have seen the double photos but never seen them through the stereoscope in 3D. It reminds me of looking into the mouth of a giant grouper through my viewmaster when I was a kid. I love 3D views, so I did some research on the popular Oliver Wendall Holmes scope and read that Hasbro makes a viewer called My3D that works with i-phone apps and i-pods. There should be some great 3D images of Saint Anthony Falls. I also have found some paintings that I haven’t seen before and I would like to overlay them with maps and photos to see how idealized they are. Here’s two I haven’t seen before. And now that I am looking for paintings, It’s fun finding the originals at Mill City, MIA, City Hall and other local spots. museum.”… From one of the SAFHB research papers. Pastoral images/ views of the natural falls. My object is not gather all images, but to find the images that tell this story well. I have reached the point where I realize how much I don’t know, but I know some good places to look. I would love to have assistance from those with better expertise or ability to navigate and display the images- a quick trip about Sprit Island from 1680 to now- as a slide show. I was thinking of looking down from the plank road sidewalk for the superimposed image of Sprit Island. I don’t think I have seen any image, painting, sketch, or photo taken from that point of view, most of the images are from downstream or upstream looking through the stone arch bridge. Thanks for all the great links, Scott. It is easy to spend a lot of time finding images and descriptions. You’re right that images of the river and islands from the west bank around the milling district are hard to find. I’m going to post two more photos of Spirit Island today, including one that is featured in the first link in your comment. Are we sure all the river’s waters went through west side tail races? 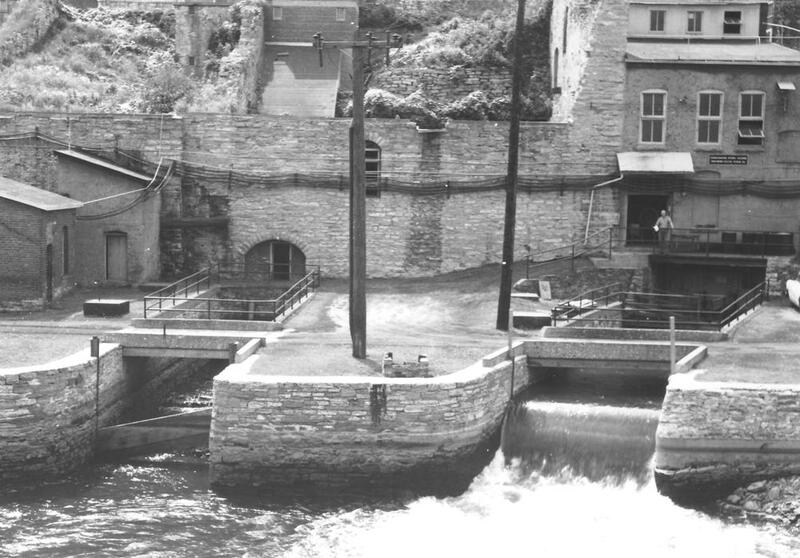 I believe the first photo includes a corner of the old still-wooded Spirit Island, and river water flowing between it and the west river bank below the Falls existed until the lock and dam was built, I believe. 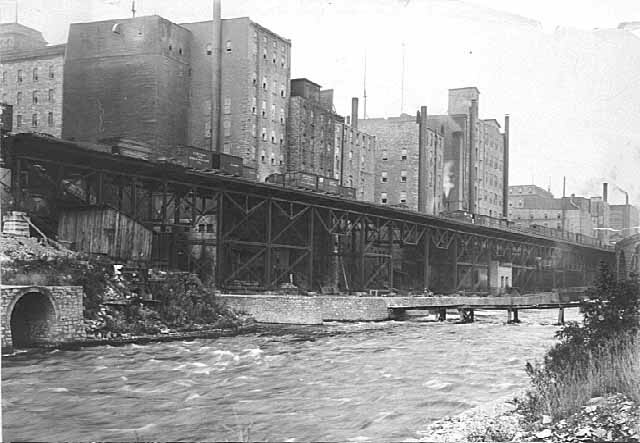 You can see the same slip in the Upton 1857 photos of The Old Government Mills on the Minneapolis side, on the same site as the Minneapolis Mill Co’s structure later in the 1870s. I remember the railroad structure–in relative tatters–in the 1970s and 1980s, when the river banks were derelict. I think the land on the right side of the photo is the land between the tail race channel and the main channel that flowed over the falls as I mentioned in reply to Scott’s comment below. See the photos I posted today (Monday) for more info on the realtionship of those lands. The photo I posted last week of the west bank in 1980 shows the trestle is not there at that time, but it could have been there in the 1970s. 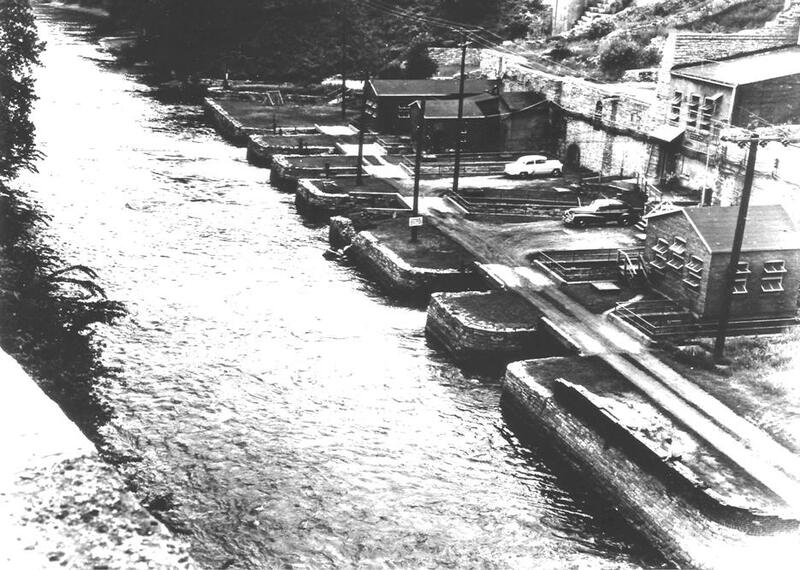 I thought it would have been taken down when the lock and dam was built in the 1960s, but I have not looked for photos to verify that. To see the 1857 Upton photo of the Old Government Mill Constance refers to, click here for the Minnesota Historical Society view of the photo. This is probably the earliest photo of the island. These are great pictures and I don’t think I have ever seen them before. I am thinking the first picture was taken from Spirit Island which I think is also in the lower right corner of the photo. I have also never seen cars parked in the “driveways” of the tail races. I think the photo was taken from the spit of land between the tail race channel and the main channel upriver from Spirit Island. I posted a few more photos today (Monday) that show the relationship of Spirit Island to the tail races and Stone Arch Bridge. I agree that seeing a road and cars crossing the tail races was unexpected. I wish I knew more about when the photos were taken. My guess at a date comes only from the cars. The light colored car looks to me to be a 1950s Chevy perhaps. Anyone who knows cars better than I might take a stab at telling us what makes and models those cars are. Very cool post David. My kids and I poured over each photo. The panorama is one of a series, as you may know, that FMR and the NPS did to document viewsheds for protection purposes. I always look forward to your posts. Thanks, Whitney. I didn’t know FMR (that’s Friends of the Mississippi River) helped produce those photos. Well done, they are really cool. I hope everyone will visit the NPS link I provided and look at the other river panoramas too. Much more excellent info on the river is available at fmr.org as well.